Tap Chat: Prairie Artisan Ales Christmas BOMB! 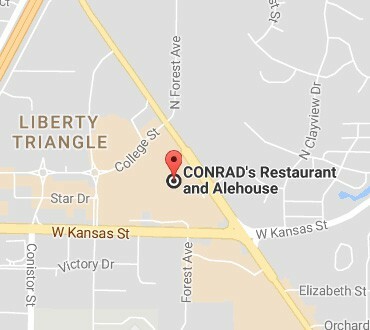 https://www.conrads816.com/wp-content/uploads/2018/12/Prairie-Artisan-Ales-Christmas-Bomb-Tap-Chat.jpg 508 902 webmaster https://www.conrads816.com/wp-content/uploads/2017/05/CONRADS_EatDrinkLocal_340x-300x138.png webmaster2018-11-27 17:28:512019-02-15 10:10:53Tap Chat: Prairie Artisan Ales Christmas BOMB! 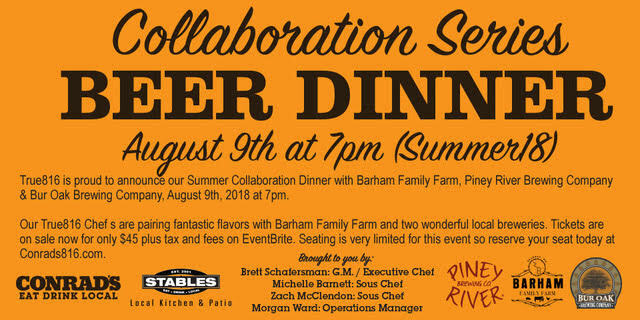 CONRAD’s Restaurant & Alehouse is proud to announce our Collaboration Dinner with Piney River Brewing Company, Bur Oak Brewing Company, and Barham Family Farm, August 9th at 7:00 PM. Our True816 chefs are pairing fantastic flavors with these two wonderful local breweries. Tickets are now on sale for only $45 plus fees and taxes. Seating is Very Limited for this event to reserve your seat today at by Clicking Here.